Mankato Ballet Company offers summer classes for all ages. We have a fantastic 4 week ballet session for ages 2-9 starting in July. It is a great way for new students to get introduced to dance in a short session and a wonderful way for current student to keep current on their technique. Current MBC students should enroll for the level they have been in this past fall. New students should enroll based on the age recommendations or contact the school to get the directors recommendation. There is no registration fee for summer classes. Tuition is due by the first week of classes. We encourage everyone to pre-register because classes tend to fill quickly. There is a cap on each class size. To ensure placement for a summer class register early! Dancers attending for summer sessions do NOT need to purchased a class leotard as we will be using the summer to place them for the fall. 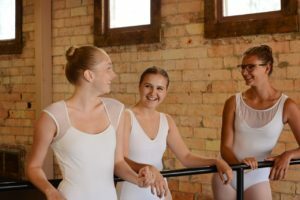 Our dress code is more lax in the summer, but we do prefer that all dancers taking ballet are in a leotard of some kind, tights and ballet slippers. Hair should be pulled off the face and in a bun for intermediate and advanced classes. Runs Tuesdays in July beginning July 2nd and goes for 4 weeks. Runs the week of July 8th. Dancers in 3A, 3B, 4A, 4B and Adult may wish to participate in our 1 week Mini Intensive. It runs Monday through Thursday from 1:00pm to 6:00pm in July. Dancers will get classes each day ranging from Ballet, Pointe, Lyrical, Contemporary, Modern, Tap, Jazz, Cardio, and Pilates. Advanced registration is required. FULL SCHEDULE coming soon. May Camp starts May 27th, June Camp starts June 17th, July Camp starts July 8th. Each camp meets Tuesday and Thursday for two weeks. We offer a Drop-In option for Ballet. Drop-In and pay $15 per class, no need to register. June Camp starts June 17th, July Camp starts July 8th. Each camp meets Monday and Wednesday for two weeks. June Camp starts June 10th and runs Monday-Thursday for one week. We offer a Drop-In option for PBT. Drop-In and pay $15 per class, no need to register. For dancers that are not currently MBC students we welcome you to attend our summer programs! If you are trying to determine which one is appropriate for you please contact our office at 507-625-7716 or send an email to info@mankatoballet.org and we would be happy to assist you with placing your dancer.